When I published a 1907 postcard of McKinley, the 35-pound mascot of Farmingdale, Maine, I must admit that I never expected to see another like it. Never say never. Here is a portrait of another enormous cat, Feathers. Somehow the name doesn’t seem to suit this handsome and pleasant-looking fellow, who beat McKinley by five pounds when this portrait was taken. “Feathers. World Famous 40 lb. Cat. 18 Years Old. Owners, Mr. and Mrs. James George, Colorado Springs, Colorado. Photographer Unknown. Postcard Postally used 15 October 1952. 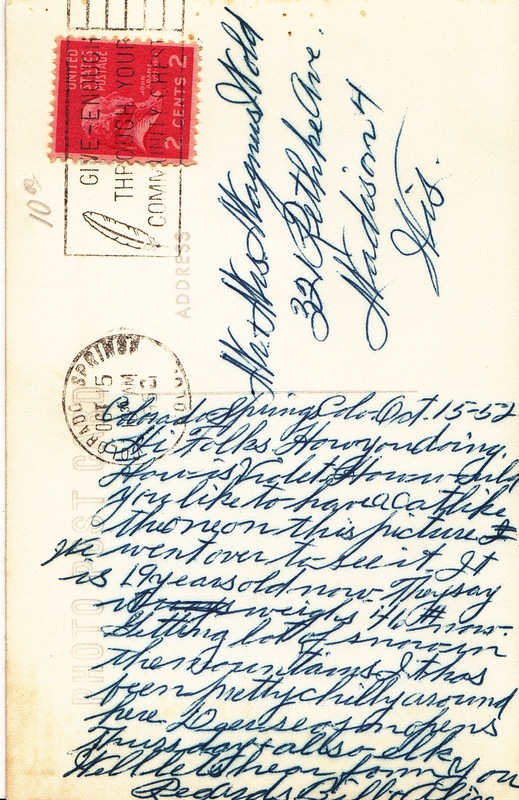 Back of the postcard of Feathers, postmarked 15 October 1952. It’s the BACK of this postcard that is especially interesting, however, and I reproduce a small image of it. The senders, Bill and Alice (their last names are unknown) actually report on a visit to see Feathers in October 1952. “How will you like to have a cat like this one in this picture. We went over to see it. It is 19 years old now. They say it weighs 46# now. ” Bill and Alice sent the postcard to Mr. and Mrs. Magnus Wold of Madison, Wisconsin — so Feathers’ fame did reach the upper Midwest. On the off-chance that someone else had a copy of this postcard and had posted it online, I did a quick search for Feathers and his (or her) owner. 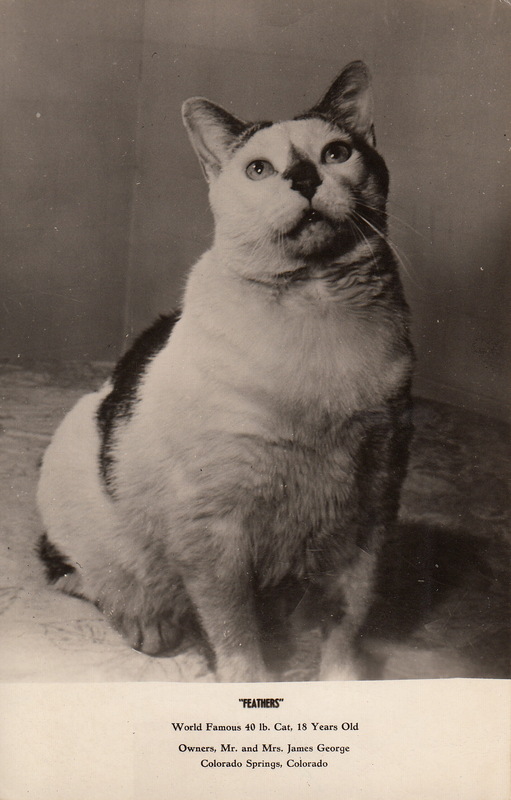 No luck — but I did discover that extremely fat cats — in the 30 to 40 pound range — are the objects of a considerable amount of public interest today. Numbers of them have turned up in shelters, where the are put on strict diets and are monitored by vets before they are put up for adoption. Local papers and television news shows seem to love reporting on them. How many enormous cats like Feathers and his “ancestor” McKinley are out there in the world is unknown. Television commercials for high-end diet cat food suggest that there are lots of them. Previous Happy New Year from Nix…and me.